I have been travelling in Mexico this week with the staff. The other night I had some strange dreams. Pretty sure the dreams were the result of all the tequila I drank that night. It’s the devil’s water. You know. In one of the dreams, I was stalked by human looking demons. Courtney Love types. Trump made a cameo as a hotel usher and cajoled me into a conference room where I got sort of a demonic timeshare pitch. It all made sense in the dream. In another dream, I had the revelation that Facebook was Skynet and controlling all human to human interaction. People were sending me birthday greetings not because they remembered my birthday but because Facebook prompted them to. Sort of a reality based dream. But when I woke up, I thought through the limits of Facebook birthday bots. They can’t blow up balloons, sign a card, or bake me a cake. So Judgement Day and Terminators baking me cakes are at least a few more years out. But I did consider changing my Facebook birthday to February 29 to see if I could cut these messages by a quarter. Post those Tequila fueled dreams, I am glad to post another post. I was tired of looking at that FootJoy catalog cover. But I did like the shoes. Not the cover. 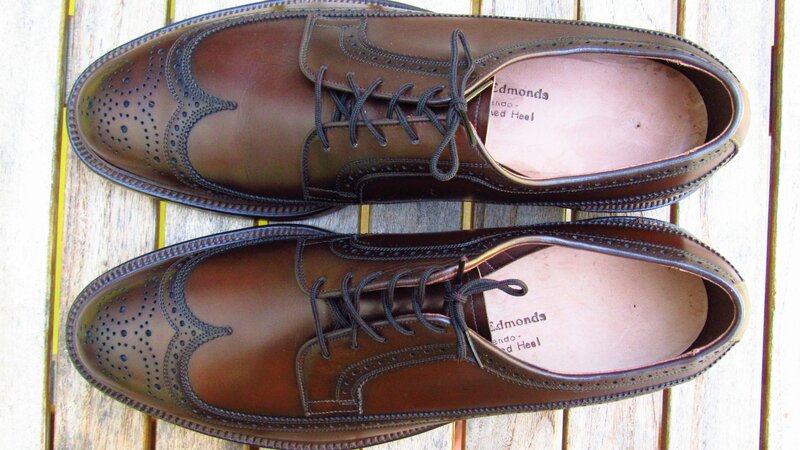 This article is about a new old stock (NOS) pair of Allen Edmonds MacNeils. This is the one and only pair I bought in the “Mother of all Vintage Sales“. They are too small for me. I bought them because I wanted them. There was no need. It’s very American of me. 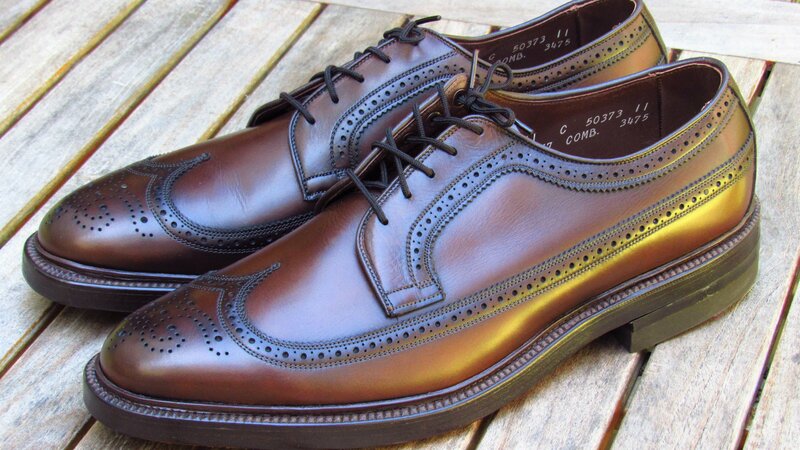 The model number of the pair is 957 which matches no model numbers in any of the Allen Edmonds catalogs. I assume it was a custom order or special run. 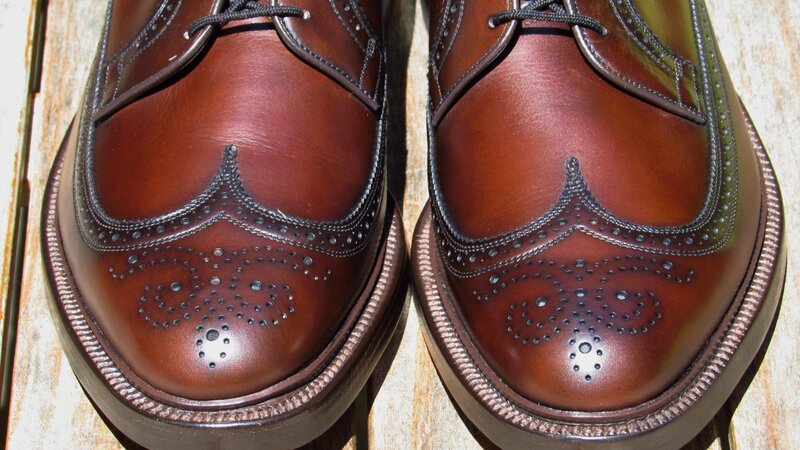 I would describe the upper color as burnished chestnut but it looks similar to pairs Allen Edmonds lists as “Chili”. The shoes are quite handsome in person. The upper leather is a smooth, soft calfskin. The leather is a better quality than the leather on recently produced calfskin MacNeils that I have seen. The stitching is very tight and well done. 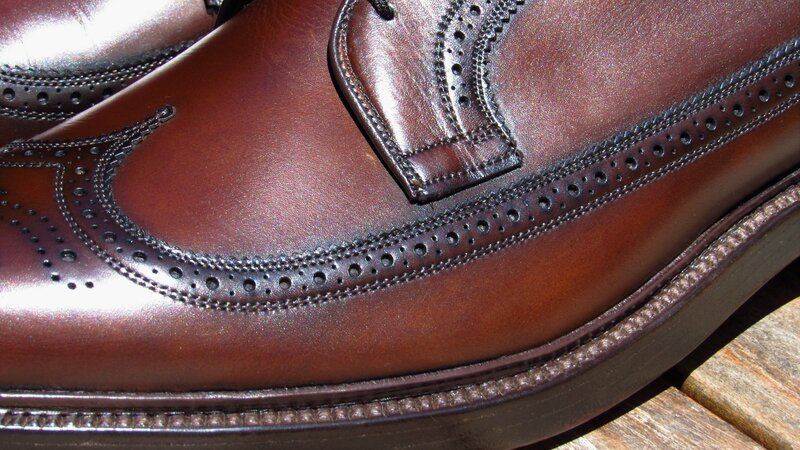 Like all MacNeils, the pair has a double leather goodyear welted sole with reverse storm welt. There is a full soft leather lining. 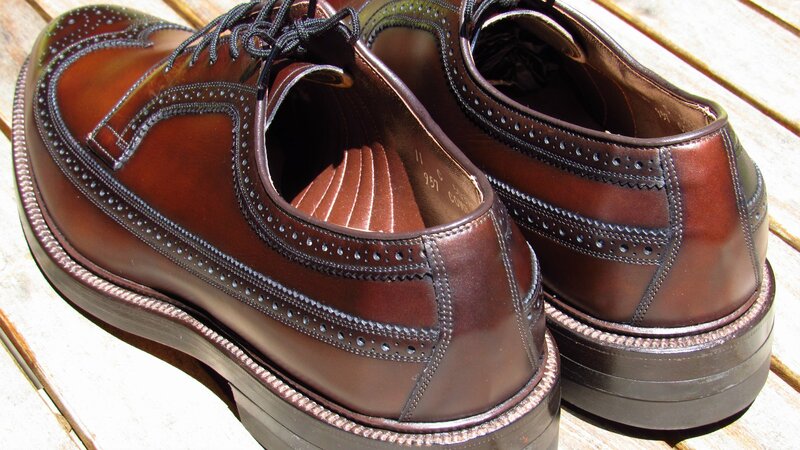 Based on information in the published Allen Edmonds catalogs, the first MacNeil model was introduced in 1962 or 1963. The model originally used the Kent last. This last has also been referred to as the 8 last (also called the 728 last). In 1964, the MacNeil switched to using the 97 last (then called the MacNeil last and sometimes the 7 last). The MacNeil has used the 97 last ever since that time. The Leeds also used the used Kent but changed to the 511 last in the late 1990s. 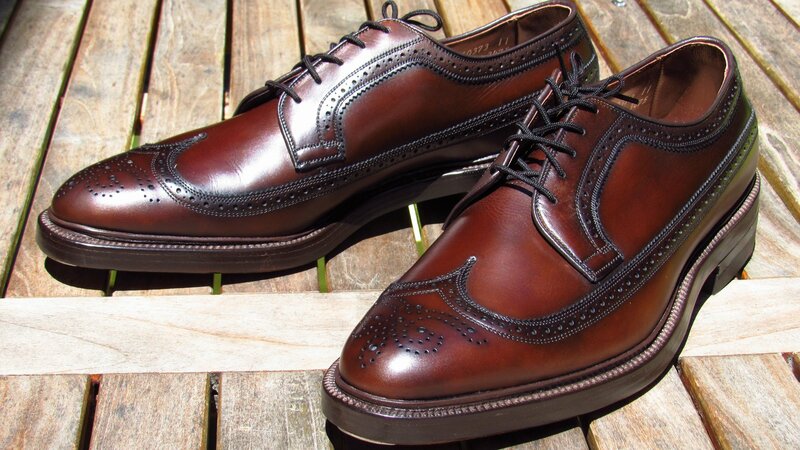 I also have a modern pair of the unfortunately named “MacNeil 2.0” that I purchased two years ago. I wear them often because they have a Dainite sole that works well in wet Seattle but I prefer the look of the older MacNeils. 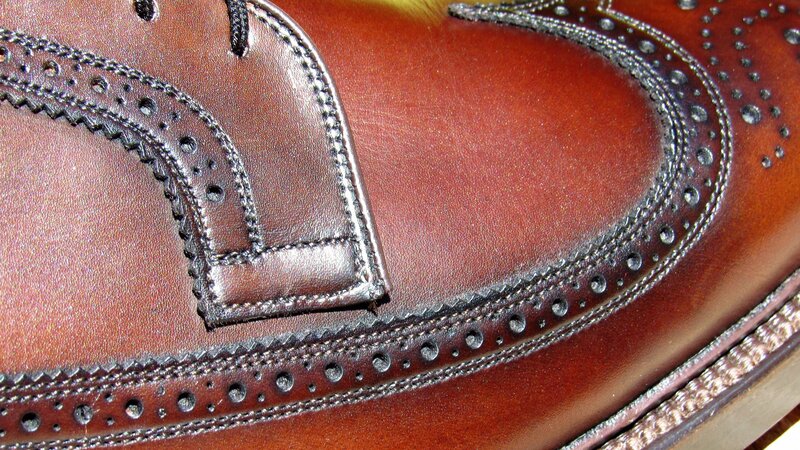 In the late 1990s, Allen Edmonds changed the design of the MacNeil to make the eyelet tabs flush with the wing. I assume this design change was done to cover the seams connecting the rear quarter leather with the vamp leather. 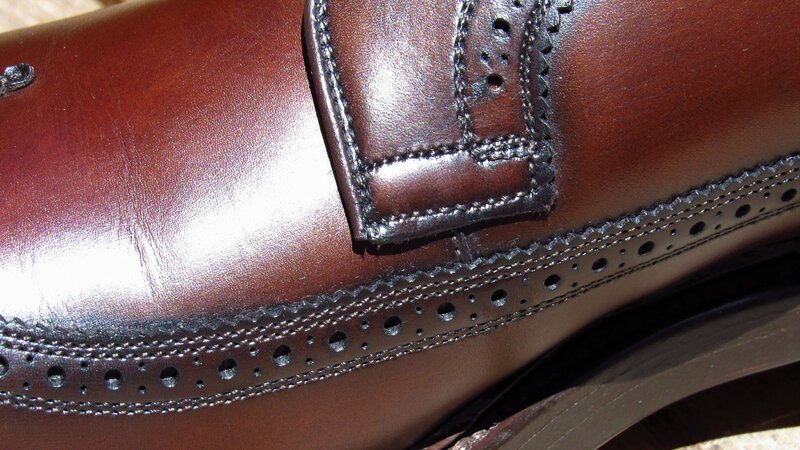 In the photos below, you can see a single seam on the inside of the shoe beneath the eyelet tab but there is no seam on the outward facing side of the shoe. The insole is labeled “Ostendo Cushioned Heel”. I couldn’t find any information on the Google that definitively gave a history of the “Ostendo” heel. The trademark for “Ostendo” was granted on September 18, 1936. The description provided to the United States Patent and Trademark Office for Ostendo is “SHOES OF LEATHER AND COMBINATIONS OF LEATHER, FABRIC, AND RUBBER.”. Which describes almost all shoes. I emailed a few photos of the pair to Allen Edmonds customer service and asked if could help date them. A couple days later I received this short response: “The footwear was made between 1985 and 1999.” I had assumed the pair was made in the 1960s or 1970s so the customer service answer surprised me. 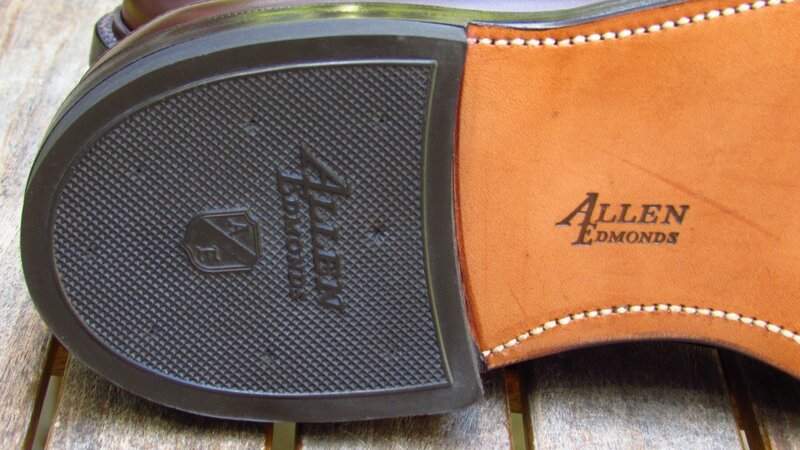 The Allen Edmonds logo imprinted on the heel and sole is that same logo appearing in Allen Edmonds catalogs between 1963 and 1982. 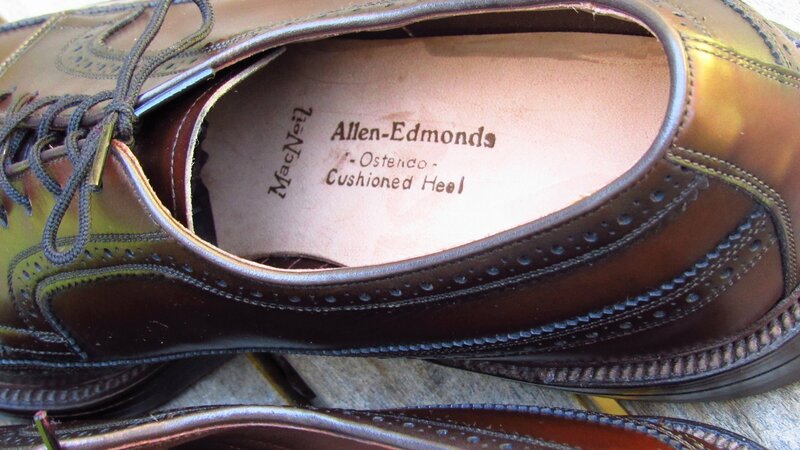 In 1983, Allen Edmonds started using the phrase “The Handcrafted World of Allen Edmonds” and put that tag on their insoles and boxes. The trademark for Ostendo expired November 16 1998. Why would they allow the trademark to expire if they were still using it? What does all that mean? That my doubts aren’t truths. 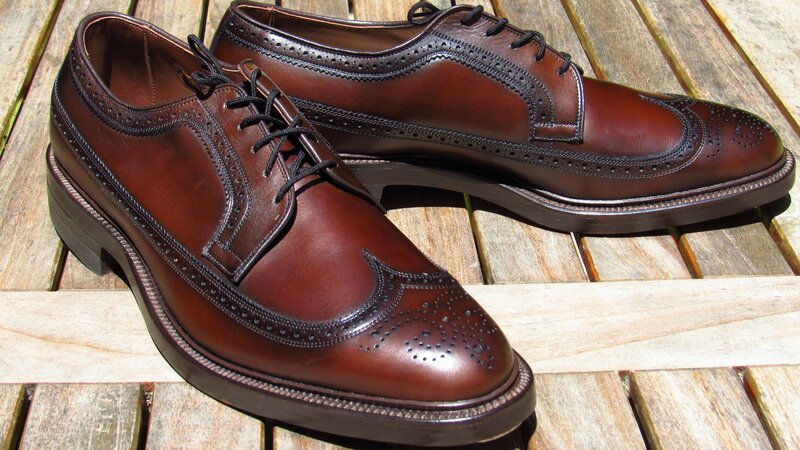 So I will go with what Allen Edmonds says since I they have considerably more resources and knowledge about their shoes than I do. This article was really shoe geeky. I spent a considerable time looking at old catalogs. But being a bit obsessive about a hobby means we are alive. It’s something Facebook bots will never be able to replicate. Facebook bots will also never wear these shoes. So sad. Below are a few more photos. If you have any additional knowledge on the Ostendo heel, leave a comment below. Those are beautiful! I think you’re right – I’d guess mid-60’s to early 70’s at the latest for those. I wouldn’t put too much stock in the AE answer – there was a fire years ago that destroyed most of their records/documents/history. I sold AE from 96 to 97, and those are absolutely not from that time period. The toplift, Ostendo, the print on the inside, all say much earlier. 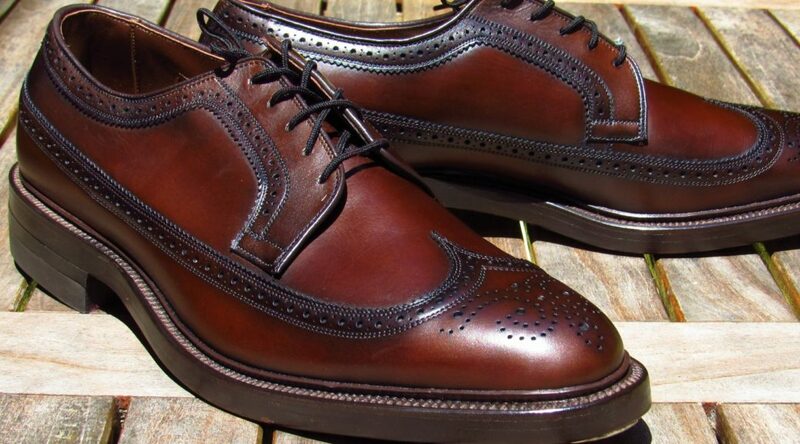 I used to see shoes like this when older guys would bring theirs in for recrafting, but I don’t recall how old any of them was. I guess they were made in 1975. The number “5” of “3475” seems to indicates the year ending. 60s Allen doesn’t this code, and “made in U.S.A” appears in late 70s. B-e-a-u-t-i-f-u-l McNeils. I started buying AE in the mid-’80s and none of those had the Ostendo-heel insole. I still have the Polo and Sanford from the late ’80s/early ’90s. Their insoles look pretty much like today’s. Damn, those are superclean, and the thickness of the sole is incredible. Your picture doesn’t capture this detail, but some older AEs I have seen also have some kind of fuzzy felt on the inside of the tongue. I’m not sure when it was discontinued, but I have only seen that a handful of times, and all on shoes that were pretty old.